Got an email from Amit about a plugin he’s written to provide Lifestreaming for users of Textpattern content management software. The plugin was born out of Amit’s desire to have more flexibility and control over his Lifestream than he had while hosting it at Tumblr. As with many other scripts and plugins as of late, he’s chosen to use Simplepie for the feed parsing. You can see the plugin in action by viewing his Lifestream. It has a sweet style and definitely has that Tumblr vibe goin’ on. 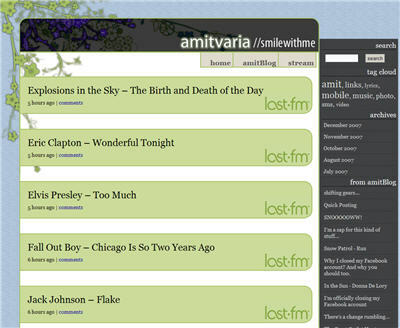 Amit actively updates his plugin and has a recently baked version 1.61 available for download. If you are in the Textpattern camp, you should definitely give this plugin a shot. First of all, thanks Mark for writing about my plugin! I really want to get the news out there that users have options to get lifestreaming. My plugin (actually called asv_tumblelog) does a little bit more than most other SimplePie plugins. Instead of just display the items, asv_tumblelog actually imports the feed as TXP articles. The benefit here is that, the feed item is now treated like a regular article, which you can layout however you like and you enable/disable commenting. All the information is stored in the same database as your regular articles, so you can search across them easily. I’m working on v2.0 right now, and it will include an overhaul of how the plugin handles media feeds (photo, video, and audio). I’m a big fan of this plugin – when I saw Amit designing it, I immediately jumped on it. I also wanted that tumblr type of feel, and I’ve been a big fan of TXP, so this worked out nicely. I need to keep customizing my site and I’m anxious to continue seeing this plugin evolve. Amit, thanks for providing more detail around the plugin. I think having each feed item create its own record in the db, and be a piece of integrated content with a CMS or Blogging platform, opens up a ton of possibilities to extend the Lifestreaming functionality. Being able to comment on individual items, search for items, tag items etc…are just a few of them. I wish you continued success with your asv_tumblelog (I fixed the name) plugin.